It can be difficult to see oneself as bold or courageous when stuck in routine, right? Being in the cycle of work, exercise and sleep can seem quite underwhelming. Well, here’s a tiny secret for you all. You may not see it, probably don’t even consider it, but each day that you wake up to conquer your responsibilities and be present makes you bold and brave. 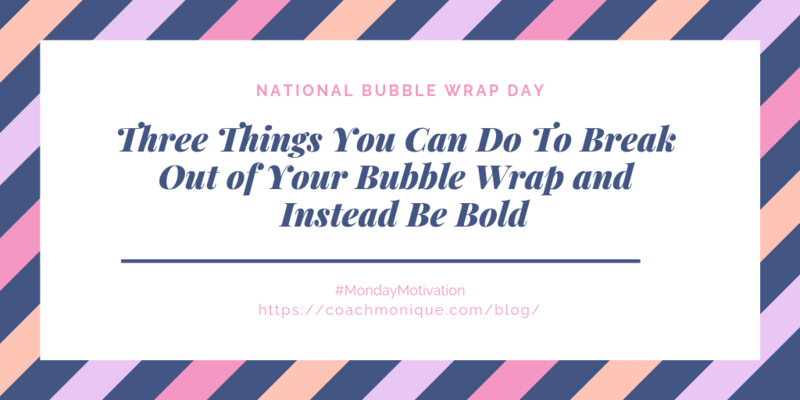 In addition to that asteroid of truth, there are three things you can do on top of that to continuing your streak of being bold and getting out of that terrible bubble wrap of routine and mundaneness. Say no and set boundaries for yourself. It’s a healthy thing to know your limits and not be a complete doormat for others to take advantage of you. Choose happiness. Practice self-love by reiterating positive thoughts and kind words to yourself. Relax and focus on today. Don’t get wrapped up on past mistakes or what went wrong yesterday. What can you do now that will help make today great? Seems practical enough, but it’s all about the mindset you’re in. Mediate and set small goals for yourself that will help you break out of your mundane routine. Build from self-love to setting boundaries and see the change that it brings you. Before you know it, bubble wrap will be a thing of the past.